Applies specifically to the 1980-1983 Suzuki GS850. 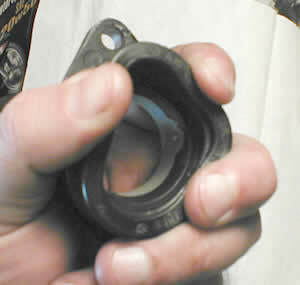 Applies in principle to other Suzuki GS models with o-ring seals on the intake boots. This repair is very simple but I felt that it would be useful to share a few tips. Obtain new intake boots if there are ANY cracks or separations in yours. Cracked or separated intake boots CANNOT be repaired with RTV silicone, chewing gum, JB weld, epoxy, Elmer's glue, or spitballs. They last about 20 years, so every GS needs or will shortly need new intake boots. If yours are bad, cough up the money and order new ones so you can forget about them and ride happily for the next 20 years. Sadly, there are no shortcuts or repairs -- they must be replaced if they are bad. PLEASE NOTE: 1979 GS850G models and other GS models use different part numbers, but the procedure is the same. The parts look nearly identical, so make sure you get the correct parts for YOUR bike. 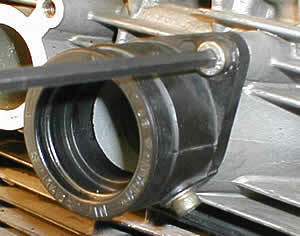 Some later GS models used short tubes instead of flanged boots between the carbs and the engine intakes, so this procedure does not apply. 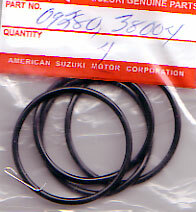 On a 1980-1983 GS 850, the o-rings are Suzuki part number 09280-38004. You can order them from any Suzuki dealer or from Ron Ayers or Bike Bandit. If you're ordering more parts at the same time, Ron Ayers is a bit cheaper than Bike Bandit, but you'll need to find part numbers on your own. In any case, the four o-rings should total less than $5, which is probably less than the shipping costs. In order to withstand the extreme heat of the cylinder head, these o-rings are made of a special material called Viton. Don't substitute o-rings from the hardware store or from an assortment! You can order Viton o-rings that will fit from McMaster-Carr in standard "inch" size 128. They come in packs of 25 for about $11.00, so there's really not much savings unless you're doing more than one bike, or you just like having a lifetime supply on hand. The diameter is a perfect fit, but these o-rings are also a bit fatter than the Suzuki o-rings, which might be good or bad. Be prepared for the cheesy phillips screws holding the intake boots to strip out. When (not if) this happens, simply cut a slot in the head of the screw with a hacksaw blade or a Dremel tool (make sure you catch the shavings) and use an impact driver with a flat blade to remove the screws. You can also just drill the screw head off and remove the stub with Vice-Grips, but this will probably damage the intake boot. Replace these screws with allen head bolts from your local hardware store. I always use stainless steel. 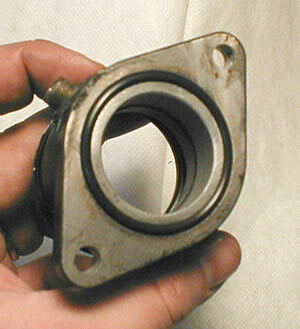 To hold the o-rings in place during installation, you can use a few dabs of grease. Lube the o-rings all over with a light coat of grease. 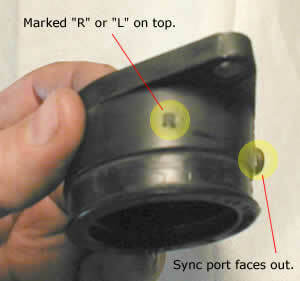 Make sure the screws and washers are in place in the sync ports. The boots are marked left and right. Don't mix them up, or the sync ports will be in the wrong places and the carbs won't fit. Make sure they're the right way up, too. The sync ports face down and out. The intake boots should be fairly flexible, with no cracks or separations. Bolt the intake boots into place. It doesn't take much - I just use a t-handle allen wrench to tighten these. No torque specs were given in the two manuals I have, but other 6mm bolts usually get something like 6.5 ft/lbs (0.9 mkg). This area of the engine is probably too hot for Lok-Tite to have much effect, but a dab of anti-sieze would be a blessing for a future mechanic. Lubricate the boots with a little silicone spray lube or motor oil and the carbs should slip into place with just a little effort. This site built and maintained by Brian Wringer. Code, layout, text, and images copyright 2004-2006 by Brian Wringer except where attributed to other contributors.